Yet another study highlights the importance of getting up and doing something—anything!—to be physically active. It suggests that sedentary people who replace some of their sitting time with even light physical activity are less likely to die early than people who remain in their chairs all day. Plenty of research has supported the idea that exercise is universally good for you, regardless of what shape or form it comes in. Last year, the U.S. federal government even released new guidelines saying as much. 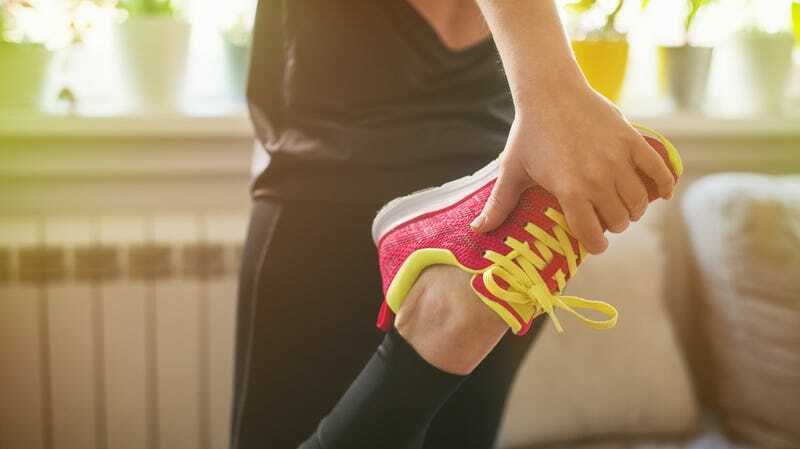 But there’s still been debate on how much exercise is really needed to cancel out the effects of sedentary behavior, considered one of the best predictors of poor health. The researchers behind this new study, published Monday in the American Journal of Epidemiology, decided to take their own swing at the question. They looked at data from a nationally representative study of middle-aged Americans in the U.S. conducted from 2009 to 2013. The original study was meant to examine differences in stroke outcomes across the country and among different demographic groups. As part of the study, volunteers were asked to wear activity trackers while awake for at least four days. Thanks to the trackers, the researchers were able to objectively measure how much physical activity any one person got in a day, as well as how often they sat. They used this data to estimate the effects of someone replacing sedentary behavior with any amount of physical activity. In total, they looked at 7,999 volunteers who took part in the original study, tracking whether they had died up until 2017. Based on their calculations, the team found that even a modest level of physical activity would lead to noticeable, positive changes. Replacing sitting with 30 minutes of moderate to vigorous exercise (anything from a brisk walk to running) a day, for instance, was associated with a 35 percent drop in the risk of an early death. Making it 30 minutes of light physical activity (a walk around the block, doing chores) instead still led to a 17 percent decrease in risk of early death. “If you have a job or lifestyle that involves a lot of sitting, you can lower your risk of early death by moving more often, for as long as you want and as your ability allows—whether that means taking an hour-long high-intensity spin class or choosing lower-intensity activities, like walking,” lead author Keith Diaz, an assistant professor of behavioral medicine at Columbia University’s Vagelos College of Physicians and Surgeons, said in a statement. Again, this really isn’t anything new. But the study is intended to clarify what we need to do to short-circuit the dangerous effects of sedentary behavior, which include weight gain and cardiovascular problems. Their own past work, using the same data, found that people who take breaks from sitting are less likely to die than people who sat continuously for hours. But in the current study, they didn’t find an effect of reduced mortality from just taking short breaks. That’s important because it suggests that getting up from your seat isn’t necessarily enough to keep you from an early grave—you need to be active with that time away from the desk for it to really matter. That physical activity doesn’t need to happen all at once in a day, and it doesn’t have to be a full-on sprint around the parking lot, the authors noted—but it needs to be something.